Suffering from traveller's tummy is a fear many people have when visiting a foreign place, especially a developing county. Research shows that one in three people may be genetically susceptible to traveler’s diarrhea, caused by an E coli bacteria. “In the future, we might be able to do a quick test to determine if someone is susceptible and if so, the logical thing would be to give them antibiotics before they travel, to prevent them from getting sick,” says Dr. Herbert DuPont, co-author of the University of Texas study. In the meantime, the ‘boil it, peel it, cook it or forget it’ rule is sensible for visits to developing countries. To further guard against poor restaurant hygiene, Dr. David Shlim, medical director of Jackson Hole Travel and Tropical Medicine in Wyoming suggests ordering only freshly cooked dishes (like meat), avoiding reheated items such as lasagna or quiche and carrying a quick-acting antibiotic such as ciprofloxacin. If you sit in a cramped airline, bus, train or car seat for hours at a time you may be at risk for a heart attack says a study from the University of Innsbruck. Comparing trips by plane and bus, the research showed that tight seating (not high altitude or low oxygen pressure) prompts coagulation of the blood and can make travelers prone to deep vein thrombosis (DVT)— a blood clot in the leg which can lodge in an artery and block blood going to the heart. To help prevent DVT, drink plenty of non-alcoholic fluids and move your “ankles and legs every hour to work those calf muscles and get them pumping blood,” advises Dr. Bo Eklof, an expert on travelers’ thrombosis with the University of Hawaii, Honolulu. 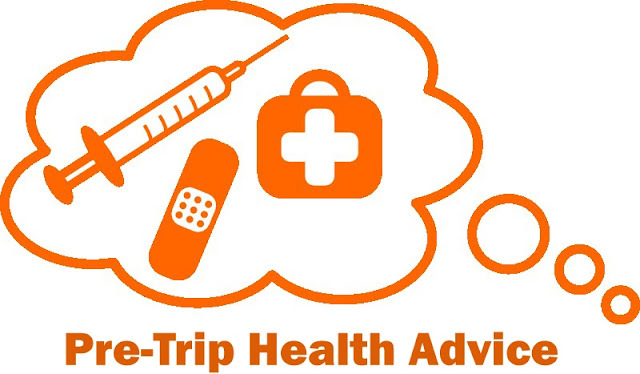 He also suggests wearing support hose and for those at high risk (recent surgery or seriously ill), getting a blood thinner injection before your trip.